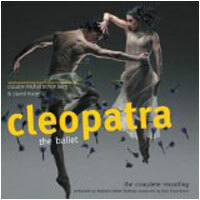 Cleopatra is a Northern Ballet production and Claude-Michel’s second ballet. After working on Wuthering Heights with David Nixon they discussed the idea of a ballet about Cleopatra. However, it was some time before they could find a satisfactory way to approach to the subject. Cleopatra premiered at the Grand Theatre, Leeds on 26 February 2011. It arrived at Sadler’s Wells in London on 17 May after a very successful national tour. David and Claude-Michel have fully engaged with Cleopatra’s story, creating a ballet which has four distinct sections. In the Prologue, Cleopatra chants to the gods, summoning the god Wadjet, the protector of the Pharaohs, who appears to her in the form of a snake. The second section deals with Cleopatra’s wedding to her brother Ptolemy and his subsequent assassination. In the third section we see Cleopatra’s relationship with Julius Caesar, the birth of their son Caesarion, their arrival in Rome and the death of Caesar, which ends the first act. In Act Two, the final section, we see Cleopatra’s seduction of Mark Anthony, Mark Anthony’s defeat at the hands of Octavian and his suicide, which is followed by Cleopatra’s death by snakebite and her ascension to an Egyptian deity. Claude-Michel’s sensational music is truly original and is well matched by David’s innovative choreography and totally amazing dancers. Patricia Doyle co-directed, Daniel De Andrade and Yoko Ichino were respectively Ballet Master and Mistress, while Charlotte Talbot, the lead ballerina in Wuthering Heights and subsequently Claude-Michel’s wife, was the Guest Ballet Mistress. John Longstaff worked on the orchestrations and John Pryce-Jones directed the orchestra. The Cleopatra CD is now available and Claude-Michel has dedicated this score to his two daughters, Margot and Lily. For a Review and Interviews see Show Updates May 2011 and for Tour Dates see News September 2010 and For Additional Tour Dates see News May 2011.